CENTERVILLE, Louisiana — We knew bold action was needed in St. Mary Parish Public School System a decade ago. Our test scores lagged behind the state average. We had several schools in academic assistance. There were large disparities in the reading proficiency of student subgroups. Over the past 10 years, we’ve launched a number of initiatives to turn around our district. As a result, we’ve improved our state test scores for all student subgroups and made significant progress toward closing achievement gaps. We’ve reduced the number of struggling readers by nearly 50 percent and reduced the number of students who need special education services by more than 10 percent. Extending the school day for struggling learners: In our middle schools, we realized we had a large population of students over the traditional age for their grade level, due to one or more retentions in grades K-8. Among these students, we saw discipline problems, high failure rates and apathy. To combat these issues, in 2009 we launched an extended day academic program for middle school students failing one or more subjects. The program requires students to attend an additional class period in English or math four days a week after school. Highly qualified teachers serve as academic coaches, providing differentiated, targeted instruction in a small group setting. Students are referred to the program by a school-level committee. The committee is empowered to promote the student to next grade level, provided that the parent signs a contract to have the child participate in the Extended Day program for the next school year. We also offer bus transportation home each day, which is expensive but absolutely essential to ensure students participate. Through the extended day program, we have reduced the number of students failing math and English, and the number of over-age students in our middle schools. We’ve also reduced discipline problems and retention rates, and our state accountability scores continue to improve. Providing opportunities for credit recovery: As part of our pledge to reduce the dropout rate and keep students on track to earn a diploma, we also launched a credit recovery program in 2009. It is an after school “fifth-block” class for high school students who have lost credit in a core subject due to failing grades or excessive absences. These students utilize an online credit recovery curriculum from Fuel Education. The self-paced software allows students quickly move through material they have already mastered, and spend more time on material they struggle with or that requires intervention from a teacher. To receive course credit, a student must successfully complete all assigned modules and pass a state-approved test. To date, we have seen high completion rates and more struggling learners are able to graduate on time with their peers. This is contributing to steady gains in our graduation rate, which has improved from 68.7 percent in 2005-06 to 77.1 percent in 2012-13. Aligning curriculum, instruction and assessments: Over the last 10 years, we have taken great care to align our curriculum, instruction and assessment to standards, including the Common Core State Standards. We established an instructional calendar for the entire district. Every six weeks, we administer formative assessments in grades 3-10 in the four core subjects. Data and item analysis have been instrumental in pinpointing student weaknesses for re-teaching and remediation. When we began this process, we brought in classroom teachers who were content specialists and asked them to form a Curriculum Department. They are now tasked with making sure the curriculum is taught correctly in our classrooms, evaluating the formative assessment results, and providing professional development and training to teachers. Having support staff with deep content knowledge at the district level has been instrumental to our efforts to improve our instruction. Making technology a priority: Louisiana’s move to the CCSS and new PARCC assessment system in 2014-2015 requires districts to be technologically ready for computer-based assessments in grades 3-11. In preparation for this, we replaced over 400 computers in school libraries during the summer of 2012. Transitioning to the rigorous CCSS also necessitates the daily use of technology in the classroom. So, over the last few years, we have added Promethean interactive whiteboards to nearly all of our English language arts, math and science classrooms. We’ve provided Internet access through wireless nodes throughout our campuses. Other technology purchases have included laptops, laptop carts, and classroom speaker systems. In 2014, we achieved all technology readiness goals set by the state, including a 5:1 student-to-learning device ratio by adding 560 computers and upgrading both Internet and WAN to 1 GB. To achieve these goals, it is crucial to make technology a district priority — but don’t get discouraged if you can’t do everything at one time. We have had to make many of our technology purchases in phases. We target particular grade levels or subject areas first, and then expand as we find more revenue streams to fund those initiatives. The key is to implement the technology very deliberately to reach your goals. Improving reading proficiency: In 2006-07, despite our best efforts, many students were still struggling readers. Our challenge wasn’t necessarily that our programs were ineffective. It was that we weren’t meeting the individual needs of students. We realized that to make the most of our programs, we needed to address students’ reading skills while concurrently developing their memory, attention, processing and sequencing skills. Toward that end, we installed computer labs and Fast ForWord reading intervention software in eight elementary schools in Academic Assistance. In 2008, for the first time in a decade, we exceeded the state average for the percentage of initial testing fourth graders reading at or above the Basic level on our state test. So, over the next two years, we extended the Fast ForWord program to all our schools. We also added Reading Assistant, an online reading tool that uses speech recognition to correct and support students as they read aloud, building their fluency and comprehension. Across the curriculum, students are benefitting from our continuing efforts to help them improve their reading and learning ability through these programs. Among the results of a five-year longitudinal study were improvements in state test scores in English language arts, mathematics, science, and social studies with fourth graders who used the programs. We also improved eighth grade state test scores, increased fourth grade promotion rates, reduced the number of students requiring special education services, and narrowed the achievement gap. Involving the school board: The leadership and support of our school board has made all of these programs and initiatives possible. Open and regular communication is vital. Don’t be afraid to give school board members all the information they want or need to understand the benefits your schools will derive from your endeavors. Thanks to our ongoing communication, our school board understands the value of research-based instruction. They recognize that teachers need current and robust tools to help students be successful. As a result of our efforts, our school board has seen the district’s accountability scores improve dramatically over the last 10 years. A compilation of all 23 school performance ratings rated St. Mary with a “B” letter grade in 2013. According to the state’s revised 150-point scale, the district attained a District Performance Score (DPS) of 107.5. Of 74 school districts that received performance score ratings in 2013, St. Mary tied for the rank of 19th in the state. Since 2004, when the district score was 79.1, we have experienced an increase of 28.4 points in academic performance ratings. Our annual increases in performance can be directly linked to our steadfast commitment and ongoing investments in meeting the academic needs of St. Mary’s students. The collaborative intensive focus on student achievement has yielded positive growth and continued academic improvement. 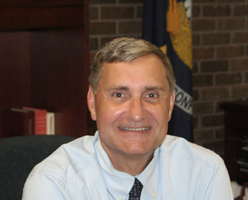 Dr. Donald Aguillard is the superintendent of St. Mary Parish Public Schools in Louisiana.